Dance Heginbotham is a new brooklyn-based dance company lead by choreographer and former Mark Morris company dancer John Heginbotham. Vixjo Design, Inc. was hired by choreographer John Heginbotham to design the brand for his new dance company, Dance Heginbotham. John wanted a brand that would reflect the artistic, but fun and playful nature of his work. One that felt equal parts exuberant, fresh, engaging, thoughtful, smart, and sensitive. All qualities that could be used to describe the choreographer and his work. 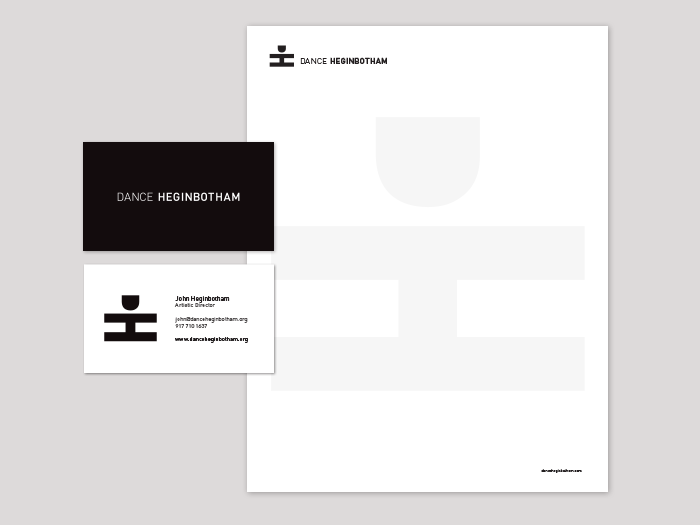 Playing with the company's initials, D and H, we formed a jubilant dancing figure that became the logomark for the company, and a fun graphic to be used throughout the brand's collateral pieces. Using the new brand elements, we designed a new skin for the company's current website homepage, with a new website to be launching soon.